There's no denying that Coney Island bears little resemblance to its high-flying heyday in the early 20th century. The magnificent spires of the original Luna Park are long gone, and most of the rides are off-the-shelf numbers that can be found at traveling carnivals. However, along the boardwalk there is an elegant patina of decay and a palpable sense of Americana. The neon signs at Nathan's fairly ooze nostalgia. And echoes of the past remain with the Wonder Wheel, the Spook-A-Rama, the legendary Cyclone roller coaster, and the shell of the Parachute Jump tower. There has been a renewed, if cautious, sense of hope, however, with the opening of Luna Park in 2010 and Scream Zone in 2011. They are part of Coney Island's much-heralded rebirth and represent a private-public partnership to help restore The People's Playground to at least some of its former glory. Coney Island fans welcome the new parks and their new coasters and rides, but some question whether the relatively small size and scope of the amusement areas can provide the spark that the area needs to truly recapture its prominence. With its redevelopment, the architects of change need to find a delicate balance between bringing Coney Island into the 21st century and irrevocably severing its ties to the past. Between creating a gentrified, movie-set facsimile of the cherished landmark and preserving an authentic sense of the place. Between developing attractions that will bring in well-heeled guests to generate big profits and shutting out the egalitarian masses that have always been its audience. For now, Coney Island is still doing what it has been doing for decades, albeit on a considerably smaller scale: bringing people from all walks of life together for thrills, laughter, great food, fun, and relief from the city's heat. Compare rates for hotels near Coney Island at TripAdvisor. Since its inception, a single operator has never owned nor managed the landmark Coney Island amusement area (unlike most modern-day theme parks). Rather, it has been, and continues to be, a collection of independent owners and vendors. Therefore, there is no central office or phone number. Starting in 2010, however, one operator has taken control of Luna Park and Scream Zone, which together, comprise the majority of the amusement area. There are no gates, and admission to the amusement areas is free. Guests purchase tickets and pay a la carte for rides and attractions. Wristbands for unlimited rides are available at each of the parks. The area known as Luna Park features a nice collection of coasters, including the classic Cyclone at one end and the Thunderbolt at the far end. The latter pays homage, in name only, to the old wooden coaster that was a Coney Island fixture for decades. The new Thunderbolt (opened in 2014) is steel coaster with a vertical lift hill and first drop as well as multiple inversions. Many of the attractions are of the spinning variety (affectionately referred to in the industry as whirl-and-hurl or spin-and-puke rides) and are off-the-shelf models manufactured by Italy's Zamperla. Luna Park also offers games, food concessions, including a cafe with a relatively extensive menu, live entertainment, and shops. The park takes its name from the original Luna Park, which operated at Coney Island from 1903 to 1946. While the 21st-century Luna Park has echoes of its famous predecessor, including the whimsical crescent moons and bright orange discs that grace its main entrance, it doesn't aspire to the ornate architecture, with its grand "Court of Honor," or the ambitious attractions that characterized the first park. As its name implies, Scream Zone is all about screams and thrills. While the coasters don't come close to breaking any records (and are actually fairly tame when compared to some of the world's fastest coasters), they are nonetheless major coasters and a welcome addition to the long-neglected Coney Island. The Steeplechase Coaster harks back to the legendary Steeplechase Ride that opened at Coney Island in 1908. Riders sit on racehorse seats rather than traditional coaster cars. It reaches a top speed of 40 mph. The Torpedo and Slingshot, however, are not for the faint of heart. They are off-the-shelf thrill rides that are typically upcharge rides at other amusement parks -- special rides that are not included with the price of admission and require extra fees. The famous Wonder Wheel sits at the center of the park. Spinning rides, games, and food concessions round out the park. Among its highlights is the Spook-A-Rama, a wonderful dark ride that transports passengers back to the 1950s era when it first opened even as it provides thrills. Nathan's Famous- The chain's original hot dog joint has an evocative vibe and great food--especially the fries. The Coney Island Circus Sideshow- Step right up, ladies and gentlemen, to one of the last genuine freak shows and a true slice of Americana. 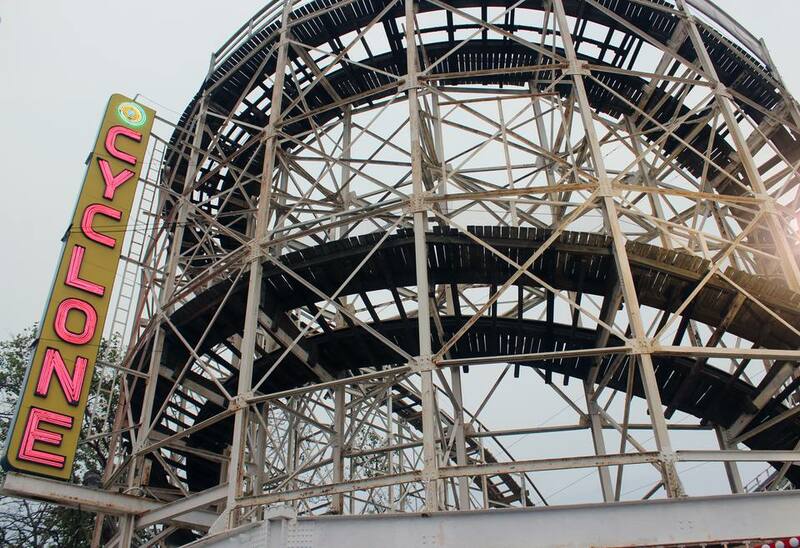 The historical importance of Coney Island can't be overstated. From the 1880s through the 1940s, it was the world's archetypal amusement area and featured three major parks: Steeplechase Park (1897-1964), Luna Park (1903-1946) (not to be confused with the modern-day Luna Park), and Dreamland (1904-1911). In 1884, the Switchback Railway, a precursor to the modern roller coaster, opened. Through the years, Coney Island hosted more than 50(!) coasters, including the circa-1927 (and still operating) Cyclone and the circa-1925 Thunderbolt (removed in 2000 to make way for the baseball stadium). Coney Island also had as many as 30 dark rides, including the circa-1955-and-still-scarin' Spook-A-Rama. At one time, riders could choose from about 15 carousels; the B&B, which opened in 1932, is the only classic one remaining. The Wonder Wheel debuted in 1920, and the Parachute Jump moved from the 1939 New York World's Fair to Coney Island in 1941. Its tower remains, but the ride is not operational. The hot dog made its debut in 1867 at Coney Island. In 1916, Nathan's Famous opened. Coney Island is in the New York City borough of Brooklyn, along the ocean. Subway: D, F, N, or Q train to Stilwell Ave., the end of the line. Driving: Belt Parkway to Exit 6. South on Cropsey Ave. toward Coney Island. Cropsey becomes W 17th St. Left onto Surf Ave. to Coney Island's amusement area. Parking: There are meters on the streets and parking lots in the area. On busy weekends, if everything appears to be full, you could drive about a mile away to Brighton Beach, which has a large parking lot, and walk the boardwalk back to Coney Island.